In two dramatic developments, 2016 saw the end of globalisation as we have known it. The first was Brexit last May, the decision by the UK to leave the European Union after 43 years of membership. It came in the only conceivable way it could happen – a referendum. The country’s elected leaders would never have voted for it, but a referendum might and did. Even now the consequences are largely unknown. It seems likely that the UK will leave the EU, but the terms of its leaving, and what alternative arrangements it might negotiate instead, are shrouded in uncertainty. The longer-term impact on the European Union is similarly uncertain. Brexit was undoubtedly the biggest blow the EU has suffered since the former Common Market was founded in 1957. The expansion of the EU from the initial six members to the present 28, was the most obvious yardstick of its success. Now the process of integration has been put into reverse with Britain’s exit: 28 is becoming 27. And in the wake of the decision by one of the largest and most influential (albeit reluctant) members to leave, others could follow. Could the EU unravel? It is not impossible. Certainly the EU has been malfunctioning for a long time: it is no accident that the EU has, with Japan, been the worst economic performer in the developed world since the Western financial crisis. It is important to recognise that the British vote was not just about Europe. It went much deeper. It was a protest vote by a large section of the population against how they felt left behind in recent decades: stagnant or falling wages, the increasingly precarious nature of their circumstances and growing inequality. These processes had been at work since the late 70s, as pro-globalisation policies had combined with the extension of the free market, large-scale immigration and the withdrawal of state provision to create a much harsher environment. The Western financial crisis in 2007-8 proved a decisive moment in this process. Real incomes are now on average lower than they were in 2007: they have never fallen before like this over the course of more than a century. Seen in this light, it is clear that the vote was not just about Europe but more fundamentally was about globalisation and the neo-liberal regime that had held sway since 1979. The same general trends are evident in varying degrees across most of Europe but the most dramatic expression came in the United States. The theme is familiar: a large section of the white male working class has suffered stagnant or falling real wages over a period of decades but especially since the financial crisis. Unlike in Britain where the revolt took a largely right-wing form – mainly because of immigration – in the US it could be seen on the left (Bernie Sanders’ challenge to Hillary Clinton) and on the right in the form of Donald Trump. Although Trump won the Republican nomination, he did so against virtually the whole of the Republican establishment. He went onto win the presidential election opposed by most of his own party’s leaders, the whole of the Democratic Party and the majority of the media. More than in any presidential election since 1945, Trump’s victory was that of a populist authoritarian leader rather than a party: in so doing he overturned many of the established norms of American democracy. How do we explain the rise of this new mood? The neo-liberal era of globalisation, which has dominated Western politics since 1980 – advocated by right and left alike, from Reagan, Clinton and Obama to Thatcher and Blair – had led to the worst Western financial crisis since 1931. And its aftermath has resulted in almost a decade of close to zero growth and falling living standards. As a result, globalisation became deeply discredited in the developed world and especially the US. The result was entirely predictable, albeit somewhat delayed, namely a wave of disillusionment in the established parties and their leaders, and a growing disenchantment with international and national institutions. Another factor is also at play. Western power is visibly in decline. America is no longer what it was and Americans can see this. Europe’s decline has been rampant, indeed in historical terms extraordinary. The continent has lost its way. Most Westerners are aware of the rise of Asia and especially China. The extent to which the authority of, respect for, and prestige of Western leaders and institutions has been bolstered by and derived from the fact that they have for so long run the world should not be underestimated. Their authority is still significant but, like the ice caps, it has been steadily evaporating. 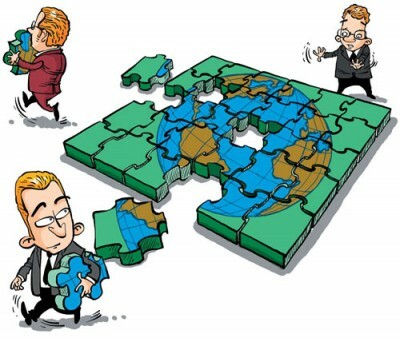 Such has been the seismic nature of the crisis that its fall-out has not been limited to globalisation. On the contrary, other long-standing assumptions are threatened or have already been undermined. It is Trump’s expressed intention to ‘Make America Great Again’, by which he means to restore American prosperity and power and halt or reverse China’s rise. His image of America is back to something like the 1950s when the US was predominant in the world and whites were dominant at home. He has questioned the ‘One China’ policy and threatens to take the Sino-US relationship back to the pre-1972 era. It is entirely possible that the European Union will not survive in its present form, a situation which would deliver Europe back to something like the 1950s. More alarmingly still, if present events have a spiritual predecessor, then the obvious candidate is the 1930s. So what will this mean for China? In 2007-9 it already began to feel the tremors from the coming earthquake when it introduced the huge stimulus programme to compensate for the dramatic contraction of Western markets following the financial crisis. Now it faces an even more severe test: firstly, there is the threat to globalisation consequent upon Trump’s declared intention to raise import duties against Chinese products, a likely more hostile attitude towards Chinese inward investment, and pressure on US companies to repatriate some of their operations; and secondly what increasingly looks like a new cold war against China. How should China react? In the face of the threat of a new cold war, China needs, in the spirit of Deng Xiaoping, to win friends and partners wherever they may be found, thereby seeking to isolate Trump as much as possible while avoiding the provocations of which he is so fond. The USSR fought the US toe to toe in the cold war: that was a huge mistake. And as for globalisation, China has already set out its store, namely that it is a strong supporter and believes it to be in the global interest. In the developing world, it has a strong ally. Two final points. It is likely that the situation will get worse, perhaps much worse, before it gets better. These unpredictable and dangerous times should be regarded as the new norm: the hitherto relatively benign environment of the reform period, namely 1978-2015, but especially 1978-2007, is now history. And second, Trump will not reverse American decline nor will he thwart China’s rise: the reason for both is too deep and too profound. But he could cause a lot of damage by his actions. Martin Jacques is a Senior Fellow at the Department of Politics and International Studies, Cambridge University.